All hospitals and nursing homes require high quality UV sterilizers to decontaminate their instruments from bacterial and fungal infections. 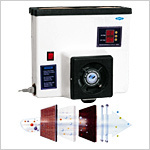 GPC Medical manufactures and supplies these UV sterilizers that have optimum usage and are effective in results. You can see our model no and place your orders. Send Your Buy Requirement For "UV Sterilizers" AND Get Quote Quickly.